Thank you to all of you who have been posting recipes! My Farm Bell recipe box overfloweth! To mention just a few, I can’t wait to try this chocolate cake the next time Weston’s vegan girlfriend is here, and I’m longing for this apple custard pie. But for now, I’m making this crock pot tamale recipe. Because the oven repairman–that Maytag is paying for! !–came yesterday. AND BROUGHT THE WRONG PART. I can’t describe the disappointment. My loaf pans cried. Or maybe that was just me. Today’s giveaway is this candy/jelly/deep-fry thermometer with a pot clip. Cooking thermometers are so much fun. They make me feel so official! For a chance to win: Just leave a comment on this post! One winner will be drawn by random comment number to receive the thermometer. Eligible entry cut-off is midnight Eastern (U.S.) time tonight (May 5). This post will be updated with the winner by 9 a.m. Eastern (U.S.) time tomorrow (May 6). Return to this post to see if you won. See the winner of yesterday’s giveaway #2 here. UPDATE 05/06/10: The winning comment number drawn by random.org is #58, Paulette. Email me at CITRgiveaways(at)aol.com with your full name and address for shipping! Thermometer would be great for making candy….we used to do the ‘drop a little in cold water and test the consistency’ method. Many variances of firmness of the fudge!! That’s a nice looking thermometer! Who won the bowl set? I would love a thermometer. Would love to win the thermometer! My repairman has been here twice for my oven…wrong part both times! Part was supposed to be shipped to me yesterday………..didn’t arrive. I can use the oven if I bake everything on the same temperature using 3, 6, 8, 0 and maybe 9. I could use this thermometer. Love the ease of this site. Would love to have the thermometer. I dont have one at this time. I would love this to win this too. You are having lots of good stuff to give away this week. 🙂 What fun. Never seen this kind of thermometer before. Hope I win and if not can you say where to get one. I love recipes and would also love this thermometer. I love thermometers too!! I also love making candy. Oh…another good item to have in a kitchen. I would really like to win this or better yet….win anything! Really did like those colorful bowls though! 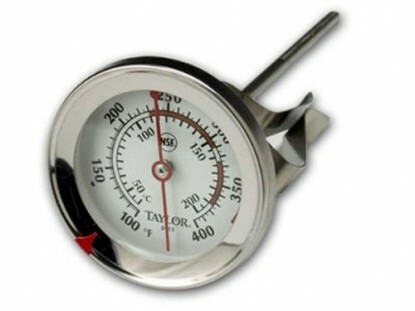 THIS THERMOMETER IS A MUST FOR PERFECT CANDY MAKING.GOOD LUCK EVERYONE!! This site is going to be so handy. I would love a thermometer. Thanks. I would love a thermometer! Great giveaways, Suzanne. Those bowls were gorgeous. Aren’t those colors pretty? Wish I’d had time to post a recipe yesterday. I will soon. We’re promised 81º today and this morning we have gorgeous sunshine after a rainy day yesterday. The gardens and fields appreciated the moisture so it’s all welcome. I hope you have a great day! Hey, I would love to win the thermometer! Thanks for the chance! I am really spending too much time here looking at the recipes! Love this site! I have a wimpy thermometer…not nearly as nice as that one. Enjoying the new addition, Suzanne! I’ve visited a lot of cooking sites and this one is by far the best! Love it! Great new site. You do wonderful work. Love the recipies and would like the thermometer. Good morning. I haven’t had a chance to try any of the recipes yet, but I am looking forward to the weekend so I can get busy with some of them. Could you please enter me in the give away? Loving the new Farm Bell recipes! Would love to win the thermometer! I don’t own a cooking thermometer whatsoever, so i’d LOVE to win this! loving the new recipe site by the way! A person would think that a repairman would have a large assortment of parts for that particular model. So inefficient to travel to someone’s home and the trip is wasted. No wonder it takes so long for someone to come out in the first place, they are so busy making wasted trips. I love this new site, it totally rocks. Wow can I use that thermometer. I love the new recipe box. Would love to win the thermometer to use to make candy around the holidays! I can’t find my thermometer since we moved, I would love to have another one! I shall keep trying!! I broke my thermometer and need a new one! Fingers crossed…. I am enjoying looking at all your recipes. Ooh, I could really use a nice multi-purpose thermometer like that! I’m looking forward to perusing all the recipes. I need some new dinner ideas! That thermometer is just what I need!!! Oh, I so need this thermometer. It would come in so handy making Christmas candy. I share your thermometer crush…little ones, big ones, ones with clips and ones without clips. I don’t have one of these in my home how crazy am I? I really would have use for a thermometer! WOW, how I’d love this! I have dairy goats and make quite a bit of cheese so would definitely give this wonderful therm a good job and good home! I’m crossing my fingers…. Great new site!! And thanks for the giveaways! Oh…I do love thermometers, also! Mine is very old and I think this would be a nice replacement! I LOVE the new blog, and oh would LOVE a thermometer! Thanks for the giveaways, very nice. Seeing all these recipes I may start cooking something new. This is fun. I absolutely love your blog, and check it at least every day. Great job! My son once mailed a meat thermometer to me. He’s a better cook than I am. Now a candy thermometer – that would be nice. I’d love to have a candy/deep fat fryer thermometer. I would love this! Thanks for all the giveways! This would be a great addition to my kitchen equipment. This site is addicting. I love looking at all the new recipes. Thanks for all of the wonderful giveaways. Poor little oven. Poor little Suzanne. Poor little DUCK! That thermometer looks a lot nicer than the one I HAD. I shut it in the drawer and it looked like humpty dumpty, never to be put back together again.Would love to win a new one. A thermometer always comes in handy! I love how user friendly finding the recipes are now! Thanks for another great give away! thermometer thermometer thermometer….after you type it a while the word just seems silly. Throw me in that briar patch. It would be great to have a new thermometer! I love this new addition to your site! 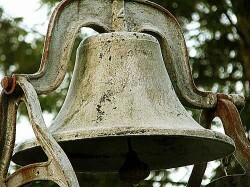 Love, love, love Farm Bell Recipes!!! And, I NEED a candy thermometer!!!! I just found this site and I love it. Can’t wait to try some recipes, I always love when I find something new to make for the family. Thank you for the chance to win the thermometer, it would come in so handy! I’d love this neat doohickey! Thanks so much for setting up this recipe site. Now excuse me… I have to go bookmark a bunch of treasures! Love the Farm Bell Recipes and would love to win this thermometer. Thanks Suzanne! I sure could use that thermometer! Please enter me to win. Love your recipes and everything about the blog…can’t wait til the next day to see what is new at your farm….Pick me.